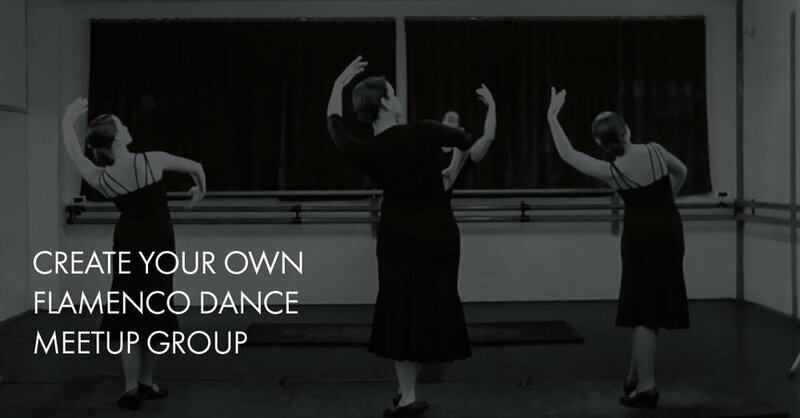 Why not start a flamenco dance meetup group in your area? Since moving to Madrid I have participated in a few different meetups that have not only been great fun but have provided me with the opportunity to make new friends and bond over shared experiences and interests. Once you have a few members you can share the cost of the hourly rate for a studio space for your practice! If you do decide to create a group here are some ideas for things you can do to get you started. The easiest way to get started would be to host a palmas practice session. In a recent live stream for danza estudio Flamenco Bites members José shared some ideas for playing with the compás of Tangos and Bulerías that would be perfect to try with a group of friends. What ever you do, keep things simple to begin with and work on developing your sense of rhythm. The good thing about marcaje is that it can also be done in non-studio locations without annoying your neighbours. Staying with the keep it simple idea, you could take a basic marcaje such as this one and then explore many variations that can come from it. Ok, you would need to hire a studio space to be able to practice footwork properly. Start with technique practice and then finish your session with one step that is a little on the edge of your collective comfort zone. Perhaps each person could bring a step with them to your session and you can take turns being teacher. The Fandango de Huelva that Jose created for our Fundamentals of Flamenco Dance course (available to all deFB members) would be a great project for a meetup group to work on. Take it slowly and try to study in detail each section so you aren't just learning steps for the sake of learning steps. At the end of a session you could create a little palmas circle for tangos or bulerias and each person can take a turn to come into the centre and try a little improvisation. This may seem a little daunting but it doesn't have to be. You don't need to create a perfect choreography on the spot, why not just try to reproduce a few of the marcaje your practice or some footwork with a simple remate to finish. The idea is to get you used to the idea of dancing by yourself and when you aren't dancing to learn our to accompany someone else. Everything on this website is available for you to use with your new friends to play with and have fun. If you do start a new group let us know how it goes.